Paul Paton told the Falkirk Herald that the Bairns were “rightly” booed off after their 1-0 defeat at home to Montrose in the League Cup on Saturday. 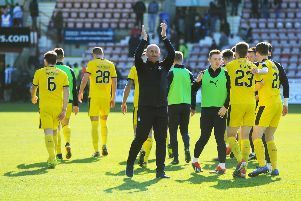 Paul Hartley’s side had nine debutants in the starting line-up, but neither Paul Paton or manager Hartley used that as an excuse for the defeat. Paton said: “Cove Rangers beat us last week and now Montrose. “We just need to man up and be better, it’s not good enough for Falkirk. We got booed off there and rightly so - I wouldn’t be happy watching that either. St Johnstone picked up two points having won on penalties after a 0-0 draw with East Fife at home, so the race for qualification is wide open. Other results are not something that concern Paton, especially at this stage of the competition. Falkirk host Montrose’s Angus rivals Forfar Athletic in the second group B match tonight (Tuesday). Paton says a similar performance will only yield a similar result, against what he believes are stronger opposition.